Dahlias grow from tubers, which are the same kind of root structures as potatoes. The tubers have eyes (also called buds) from where the plant stems grow. Dahlias are not hardy in USDA Hardiness Zone 5, which means they will not survive your winter months. Therefore, you must wait to plant your dahlia tubers until after the last frost of the season, which may not occur until May in your climate. Then, in the fall after the dahlia foliage dies, dig up the tubers and store them for the winter months to plant them again the following spring. Choose a planting area that is exposed to a minimum of 6 hours of daily sunlight. Dahlias need at least this amount of sunlight in order to thrive no matter what zone it is planted in, including zone 5. Prepare the soil for ideal planting conditions. Turn it over to a depth of about 12 inches with a hoe, garden rake or rototiller. Then, incorporate 2 to 4 inches of organic material, such as compost or aged manure, and 2 to 4 lbs. of balanced fertilizer (e.g., one labeled 8-8-8 or 10-10-10) for every 100 square feet of planting space. Plant the tubers about 6 inches deep. It should be wide enough to lay the tubers on their sides in the holes. Lay the tubers on their sides with the eyes facing up. 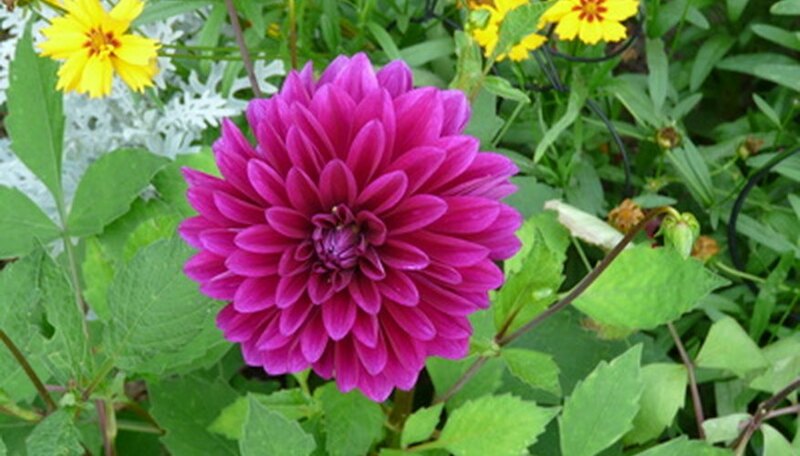 Separate individual tubers about 18 to 24 inches, but larger dahlias may need more space. Set wooden or plastic stakes on either side of the tubers. Stakes will provide support for the dahlias as they grow and start to bend. Inserting the stakes at a later time may cause damage to the tubers and roots. Backfill the soil over top of the tubers and pack it lightly down. Water the planting site with about 1 to 2 inches of water. You do not need to protect your dahlias with mulch in zone 5.